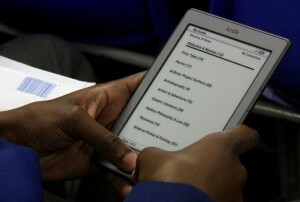 Pilot project explores the potential of using Kindle eReaders in underdeveloped schools. Johannesburg, 26 July 2012 - The eLibrary Project officially launched at its beneficiary school, St. Francis College today. The innovative project aims to promote literacy development by providing teens at disadvantaged schools with Kindle eReaders to supplement their access to literature. 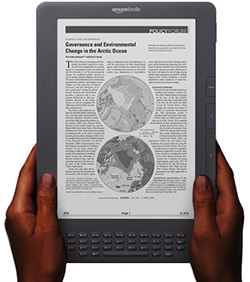 60 Kindle eReaders have been purchased by the project directors since the inception of their fundraising activities in May 2012, which focused primarily on their personal networks and some media and publishing corporate donors. Members of the public, corporate donors, learners, teachers and the principal, Dian Cockcroft, of St. Francis College gathered in a special assembly today to celebrate the hand-over of the devices, pre-loaded with nearly 300 books. Each learner will have their own Kindle for a year which will be accessed in the school library. The excited Grade 11 boys and girls were also tutored today on how to use the Kindles by the project directors, Mark Oppenheimer and David Ansara. 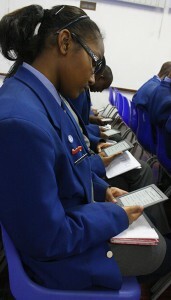 Kirsten Innes (17) and her Grade 11 classmates at St. Francis College, Benoni, learn how to use their Kindle eReaders. Kindles could play a significant role in improving the reading experience and academic advancement of children. This theory will be put to the test during the pilot project at St. Francis College over the next year, where 60 Grade 11 students will use the devices in the classroom and the school library. This study could provide valuable information for the future use of gadgets in the classroom in South Africa. A learner at St. Francis College, Benoni, browses a collection of almost 300 eBooks on his Kindle eReader, donated by the eLibrary Project. Note: Additional images and higher resolution versions are available upon request.